Not sure if I believe in love at first sight when it comes to finding that certain someone, but I sure do believe in love at first sight when it comes to places. For me, that place will always be Hawaii. The past year has been a whirlwind. Almost too many milestones to digest at once: graduations, entering the empty nester phase, a couple of family health detours, new adventures and our self-proclaimed year of travel. Our philosophy on airline miles and hotel points? Use them now. Life is short and you never know. Carpe diem. We went to Istanbul. We went to Greece, Italy and France. For my husband’s milestone birthday, we went Costa Rica. And then there was a trip to Oahu that we had planned for our anniversary in March: Now on hold with work and other obligations. They say that April is the cruelest month, but I disagree. In the Midwest, it is March. February is a close second. The holidays have come and gone. The snow, cold and ice remain. Even in a mild winter, there is darkness. There is sleet. There is black ice on the roads. In April there is hope—the days finally seem longer after the cold and we rejoice in the fact that we’ve turned a corner. Although I painfully remember that we had snow in May of last year. So, in the meantime, I think of my one true love. Yes, that would be this guy—the one I married on my first visit to the Island of Hawaii many moons ago. For anyone contemplating the idea of a Hawaiian wedding, I highly recommend Rev. Libby from Weddings A La Heart. 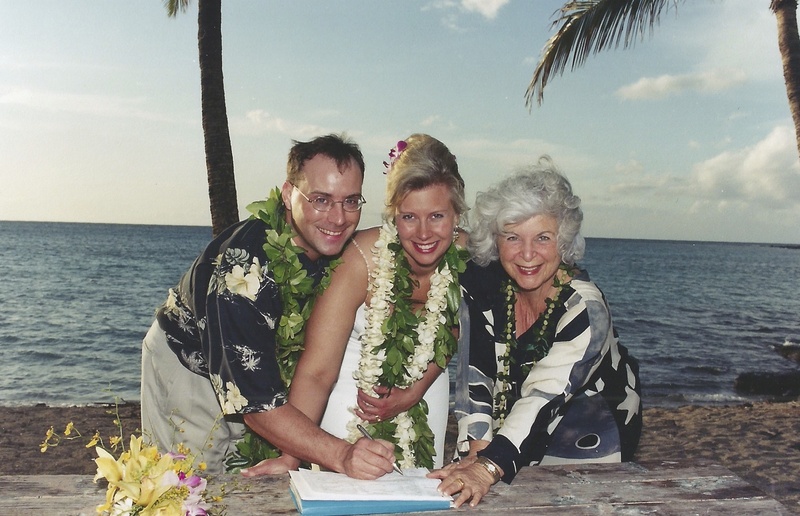 Here she is with us on the Kohala Coast signing our marriage certificate—before they went electronic. Our ceremony could not have been more perfect. Love. For today, I’ll dream of the place in the world where it all began. The thermometer tells me that it is -2 degrees outside today. In my heart, it’s 78 with a light breeze. Happy Valentine’s Day. Aloha. 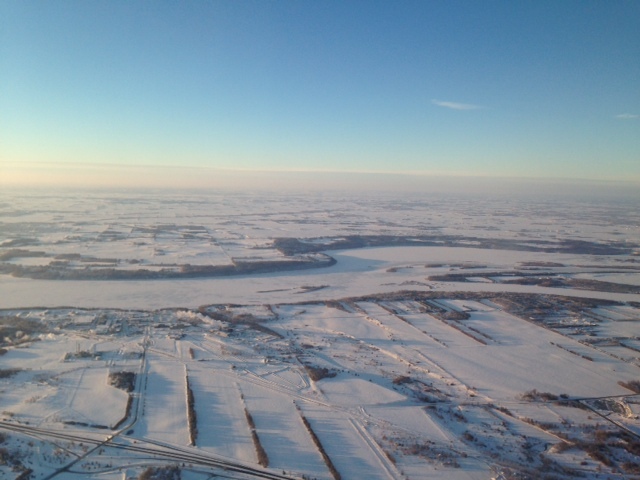 This was the view above the Mississippi yesterday morning. A frozen sea of white, but at least we have a brilliant blue sky to help us get through the predicted low of -2 on this Sunday. The snow, heavy and relentless, made for harrowing commutes and window-high drifts. We are running out of places to put our shoveled snow. Here, we have tools like roof rakes to deal with ice dams and roof leaks from the melting and freezing. 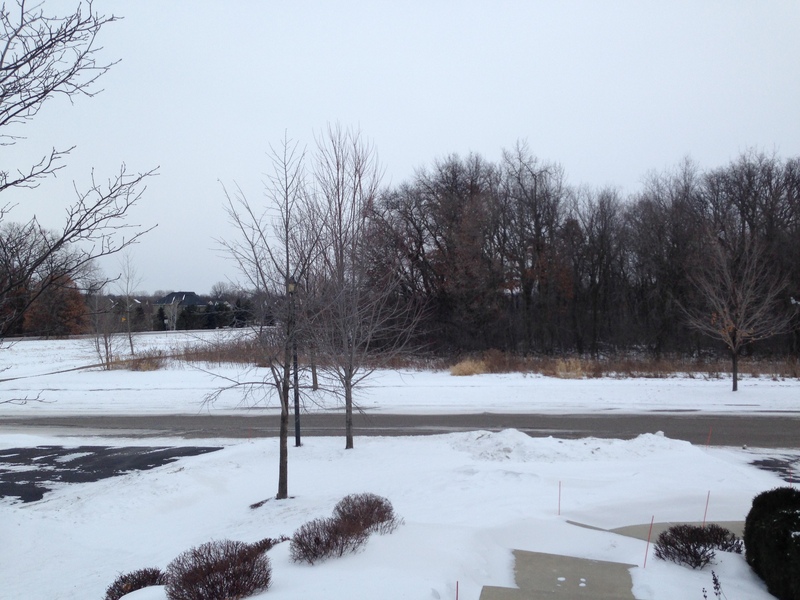 Perhaps the most difficult part of our winter is that it’s only February. Last year we had snow in May. Meanwhile, it’s comforting to know that elsewhere in the world, brilliant blue means something else. 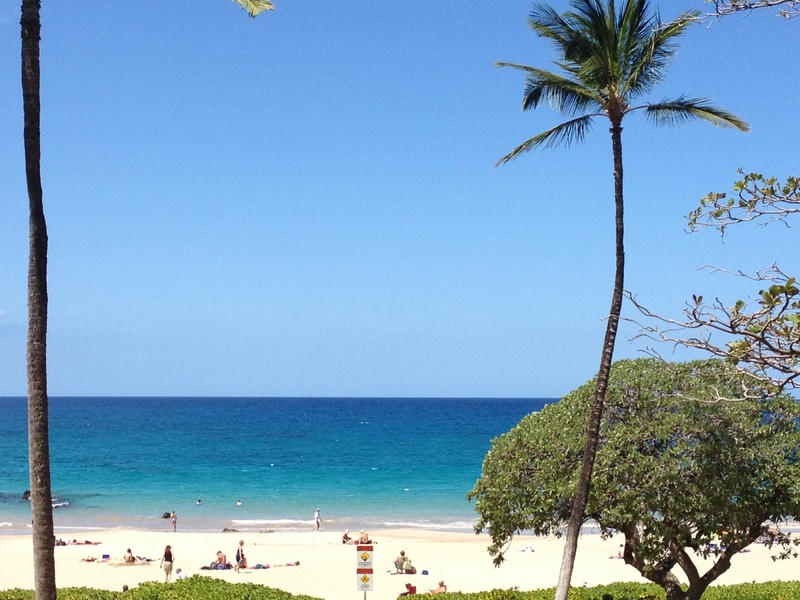 For example, on Hapuna Beach on the Big Island. 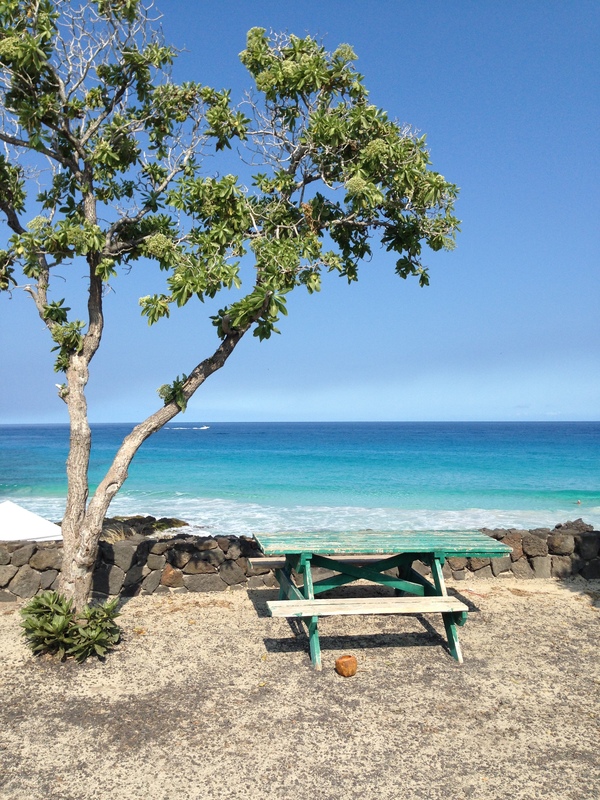 Or, the stunning Kohala Coast of the Big Island. Cabin fever has officially set it. This is when we find ourselves on vrbo.com, searching for a warm getaway. If someone has been lucky enough to escape the cold, this is not the welcome back you hoped for. Somewhere, under all of that, daffodils and tulips are waiting for spring. On a Sunday morning, dreams of Hawaii get me through winter. We have Hawaiian music playing in the house. I may find some mac nuts and Hawaiian spices in the cupboard for creative cooking. Oh, and if anyone living on one of the Hawaiian Islands needs a gardener next winter, drop me a line. It’s Friday and the start of a holiday weekend. Time for a Mai Tai? 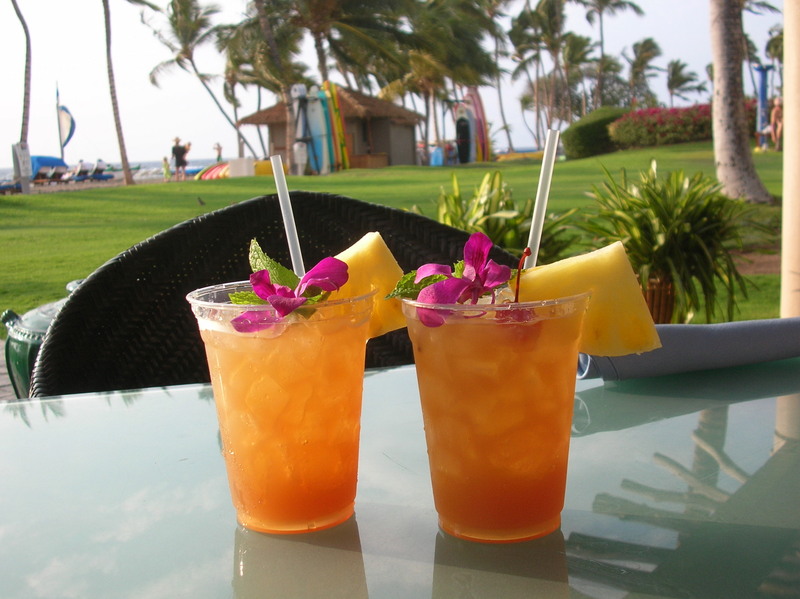 The Mai Tais at the Mauna Lani on the Big Island are impossible to replicate. Perhaps it’s the setting? Still, one can try, right? Sun, surf, sand and the end of a week in paradise. The view from the edge of the earth on the Big Island’s Kohala Coast. Aloha. Wish I was there. Reading Walter Isaacson’s biography of Apple founder Steve Jobs was fascinating to me for many reasons. First, I am a big fan of all things Apple. Jobs completely transformed so many aspects of our lives through his visionary leadership at Apple including computers, phones, how we listen to music, publishing and more. I was intrigued when I learned that Jobs also found a visit to Hawaii a rejuvenating experience. In the book, I learned how Jobs would visit the Big Island and specifically the Kona Village Resort. 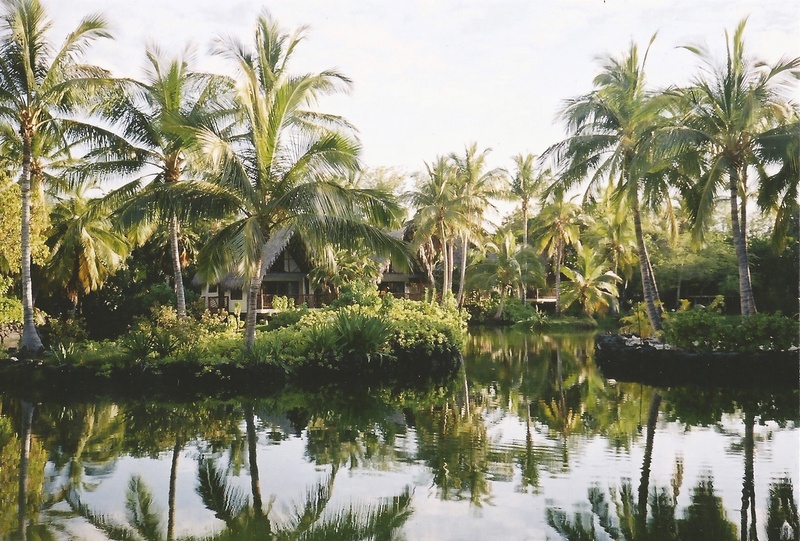 These photos of the grounds on the Kona Village are from 2004. They are somewhat grainy as they are scanned images from a camera no longer with us. Although we never stayed at Kona Village, we were lucky to have a tour of this special place. Kona Village opened in 1961. It was different from any resort we have ever visited. No televisions. No air conditioning (you don’t need it here with the ocean breezes). No phones (easier to accomplish before cell phones, but still admirable). No tall buildings or high-rises on this 82-acre slice of paradise. Your room was a Polynesian-inspired thatched bungalow. Meals were served in a gorgeous building in a group setting. Enchanting. Old Hawaii. We were even told that at one time, they had their own runway for private airplanes visiting the resort. This was not the fanciest or most high-tech place to stay. 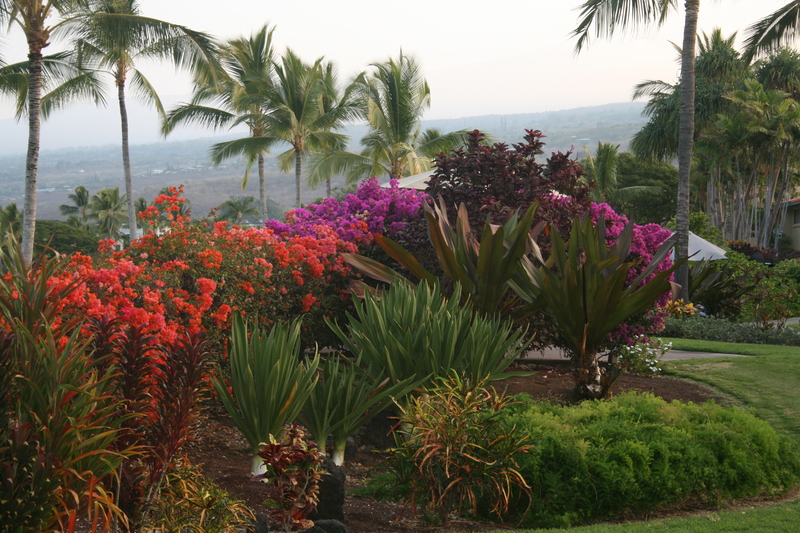 This was the Big Island at its best—surrounded by natural beauty and the relaxation and serenity that come with it. The Hawaiians have a beautiful word for family. It’s ohana. Ohana, to me, perfectly describes the feeling of this resort. Now the sad part. It is currently closed and has been since March 2011, when it suffered significant property and structural damage from an earthquake-generated tsunami. 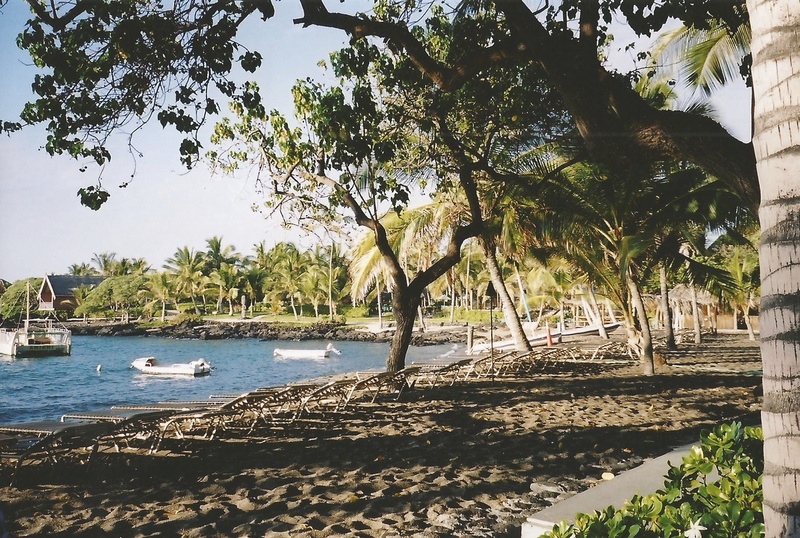 Over the years, we have met people who made this their family trip and had returned to the Kona Village for decades. We’re talking generations of grandparents, children and grandchildren gathering for an annual or bi-annual gathering at the Kona Village. The very meaning of ohana as the staff would get to personally know and care for these families over the years. The Kona Village website tells us that the goal is to one day open the resort again and that repairs are in process, certainly a huge and complex project. I know that there are many people hoping and waiting for that day to arrive. Until then, the resort operators worked with the Governor of Hawaii and nearby hotels to help the employees find jobs at other nearby resorts. It’s my understanding that a number of resorts, including the nearby Four Seasons Resort Hawaii at Hualalai, have employed the Kona Village’s former employees. Hopefully, I will be able to write an update someday that the Kona Village is once again open. It is truly a special, one-of-a-kind place on a special, one-of-a-kind island. It’s a common misperception that the Big Island is not the island to visit if you are looking for the quintessential Hawaiian beach experience. The picture perfect, fine, soft sand beach you would expect to see on a postcard. Yes, the island’s landscape is filled with lava and there are many gray and black sand beaches, and even a green sand beach at the island’s southernmost point. These beaches are uniquely gorgeous and you should visit as many as possible. This could be a good lifelong goal to set. 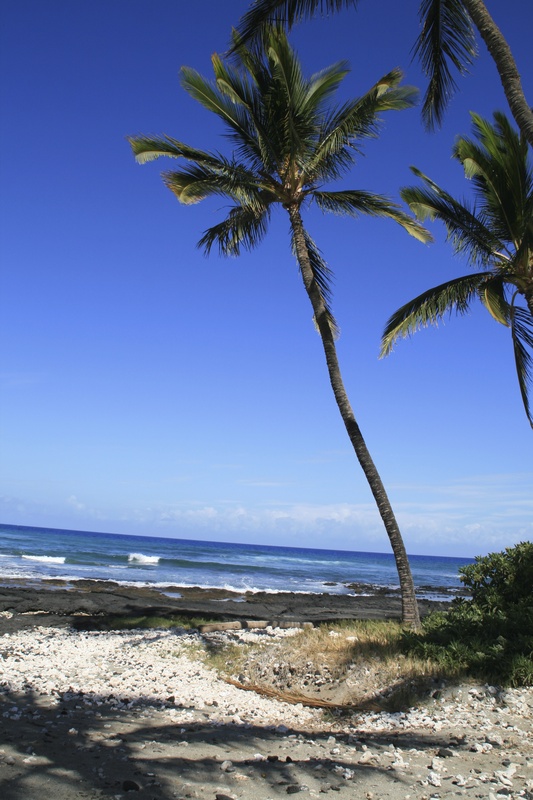 Head north, however, and you will discover one of the world’s top rated beaches on the Kohala Coast side of the island—Hapuna Beach. I took this photo with an antiquated cell phone camera on a whim. You could point and shoot anywhere near this gorgeous beach and your photo would turn out beautifully. Although I am not too much of a spend-all-day-at-the-beach person, a visit to Hapuna Beach is a must when visiting the Big Island. It’s one of the most peaceful, calming places you could imagine. Give me my 50 SPF, a place in the shade, a good book and I am set. 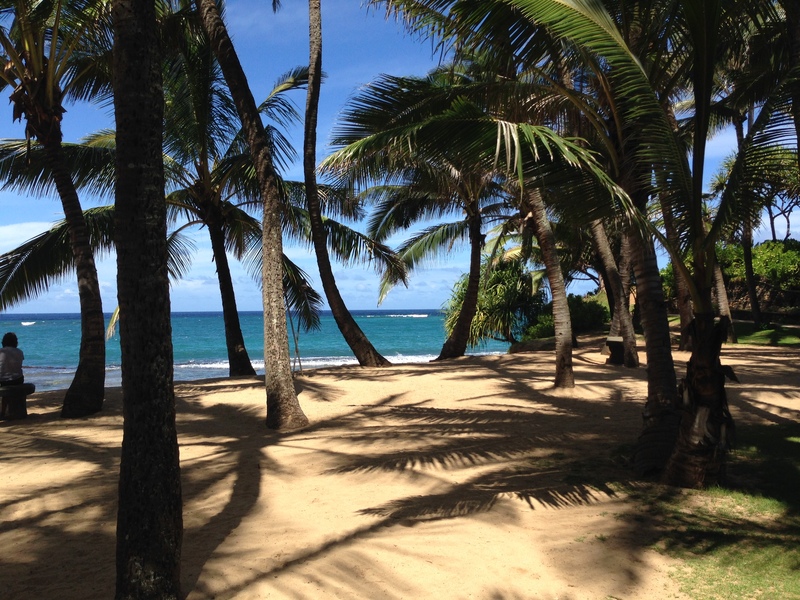 Parking is a breeze as the beach is part of the Hapuna Beach State Recreation Area and there is no entrance fee. 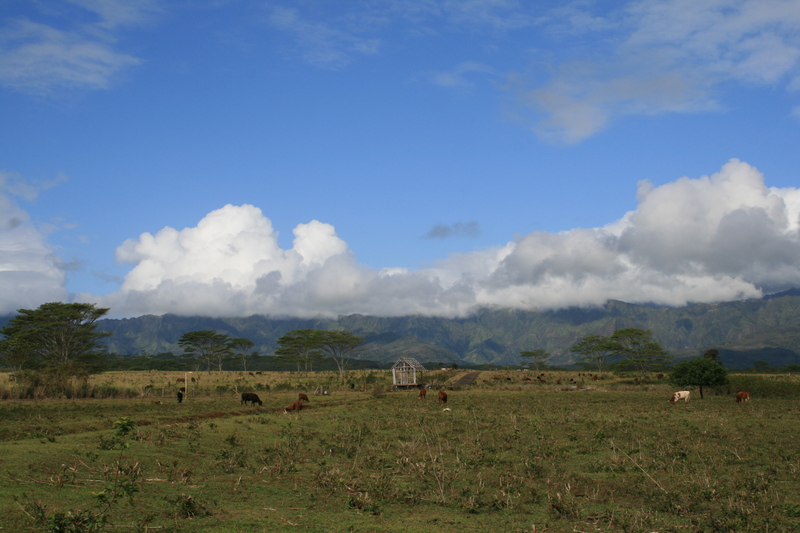 The entrance is on Queen Ka’ahumanu Highway (Highway 19), 2.3 miles south of Kawaihae. This place is a gem. It’s April 10 and in the Midwest we are in the middle of a major spring snow and sleet storm. Hawaii, how I miss you. Where we live, the weather forecast calls for snow, sleet and ice, so I am desperately trying to hold on to the memories of yoga by the sea. 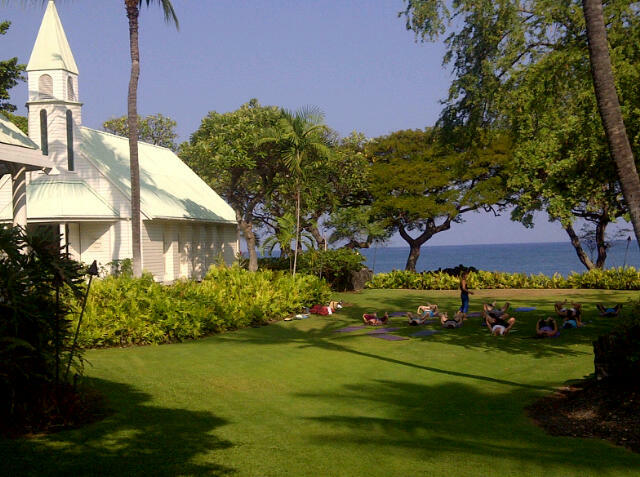 It would be difficult to think of a better location for yoga than Hawaii. 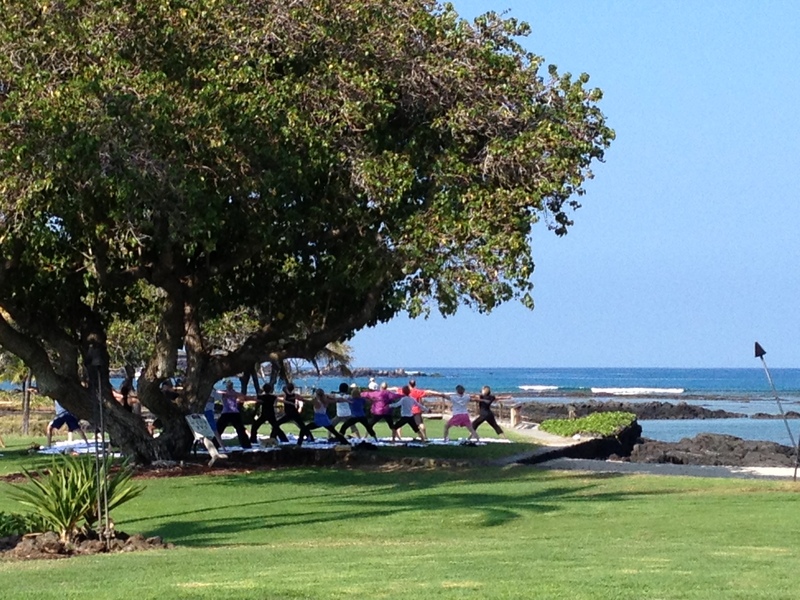 This photo is from a morning beach yoga session at the Mauna Lani Bay Hotel and Bungalows on the Kohala Coast of the Big Island. You do not need to be staying in the hotel property to participate. You may purchase one class or a package at the Manua Lani Fitness Club. One session is currently $16, a package of 5 is $70 or a package of 10 for $120. To purchase a session or package, just stop by the Mauna Lani Fitness Club. Considering that a yoga class at my favorite local studio is $15, I would call this a bargain. The instructors were terrific. My favorite line was when one instructor said, “This is not New York City yoga. This is Hawaii yoga. Breathe. Relax. Look at the whales jumping out of the water.” And just like that, there they were. Whales frolicking and playing in the sea close enough for us to relax and deepen into our pose. Unforgettable. This is my kind of yoga practice. 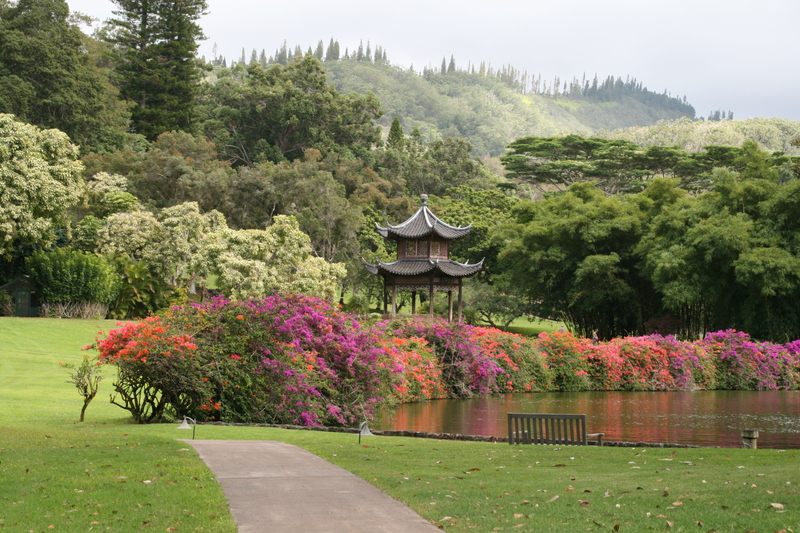 There are many other places on the Big Island offering yoga. Here’s a shot of another outdoor studio in Keahou at the Sheraton Kona Resort & Spa at Keahou Bay. During the 60-minute beachfront practice at the Mauna Lani, the morning sun shifted in the sky. The milo tree provided a shady outdoor studio. 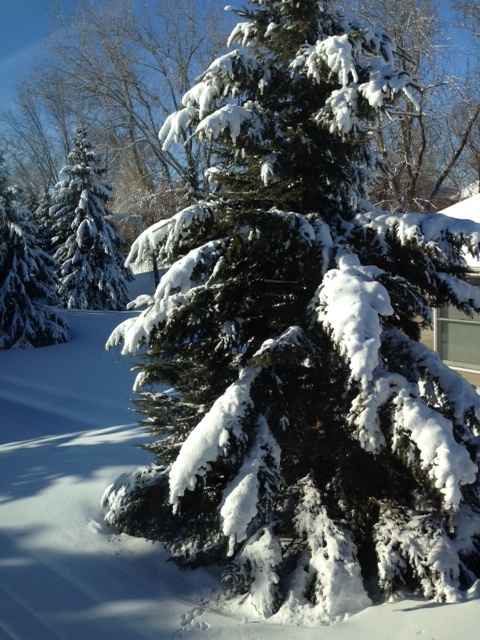 This is a memory that keeps me going as we wonder when spring will arrive in the Upper Midwest. Honu is the Hawaiian term for these magical, ancient creatures—the green sea turtle. You will find the honu on the beaches or relaxing and resting on the lava rocks while they sun themselves. They are also active in the water as you snorkel near the shore. They are indigenous to Hawaii and are viewed as a symbol of peace and good luck. They are fortunate to live in some of the most beautiful waters in the world. These creatures need our help to survive and thrive. The green sea turtles are protected under the Endangered Species Act. Many people and nonprofit organizations have worked diligently over the years to protect the turtles. It is critically important that you do not disturb, touch or bother them. They almost seem to sense that they have this protection as they do not seem afraid of humans and will swim nearby when you are snorkeling. It’s okay to admire, but under no circumstances should you disturb or touch them. Apparently the honu lifespan is similar to that of humans and they often live to be 80 years or older. 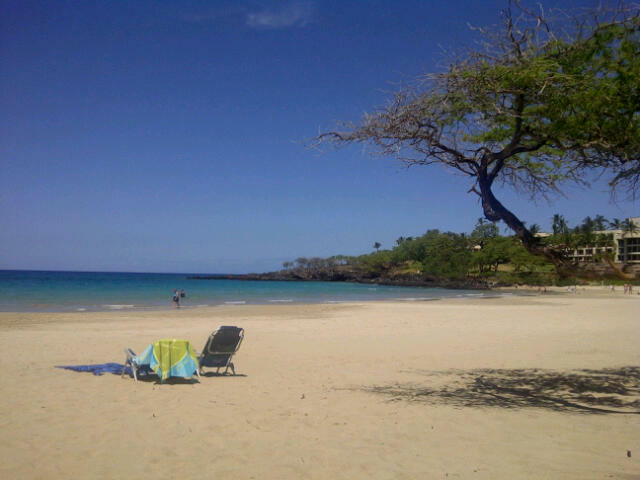 In March of this year, we were walking on a fairly quiet part of the beach on the Kohala Coast. We weren’t expecting to run into a turtle, but there it was half asleep, resting and oblivious to us humans. We quietly admired for a few moments and then moved on. They are amazing. 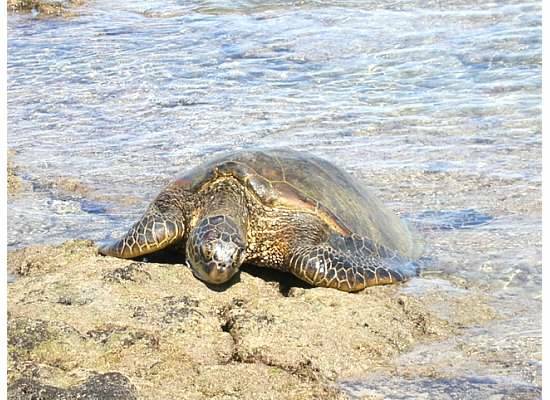 For the past 24 years, the Mauna Lani Bay Hotel and Bungalows on the Big Island’s Kohala Coast has held a Turtle Independence Day on July 4. For two to three years, the baby honu are raised in the ancient fish ponds of the Mauna Lani. They are lovingly cared for until they reach an age and size suitable for entering life in the ocean. More than 200 honu have been released in the past quarter century at the Mauna Lani on the Fourth of July—a fitting way to celebrate our nation’s independence.